I've come across some interesting articles on how to do 3D on the net, but in my opinion, none were really explained in the most intuitive way. The purpose of this article is to try and explain exactly what's happening, step by step, so that you can not only create a successful 3D routine, but also understand it - so that you can manipulate and adapt the code into something more. Also, you'll discover that the math and logic behind 3D is not as blindingly complex as might first appear. I've done my utmost to keep the code as short and efficient as possible, whilst also making it as easy to follow as possible. As I mentioned earlier, the code I'll use will be closer to something BASIC-ish rather than outright C or machine code. This is so that (hopefully) everyone will be able to understand. Also, you'll need to use floating point arithmetic, because the decimal point is needed. What the program will do: In a nutshell, when it's finished, the program will convert a batch of 3D coordinates into '3D-erized' 2D coordinates, so that they can be displayed on the screen. 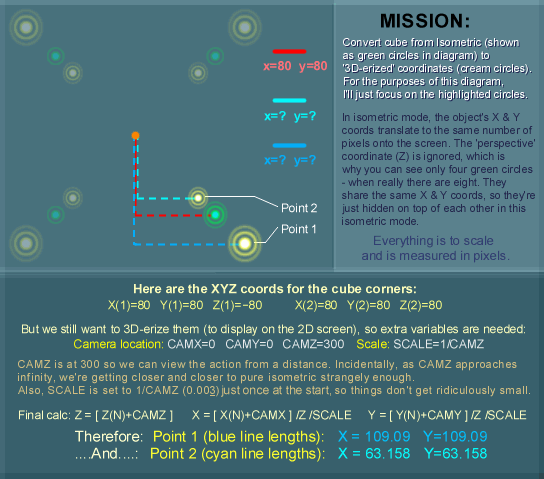 Numerous object coordinates (X, Y, Z for each object point). (The 'Pivot Position' is the point in 3D space at which the camera rotates around when the Camera Angle is adjusted. It's optional and is not required to see 'all possible' views, but is often convenient to more easily set up a specific position or animation). The program will use the above inputs (specifically the first 9 variables as the Pivot Position is excluded), and output new 2D coordinates which have been '3D-erized'. So first things first :) Before we make the leap to 3 dimensions, it's best if I show you how 2D works. The code will be the basic skeleton for the full 3D routine. Sideline: A little note in the syntax I'll use. The "...." symbol effectively means a break in the code to signify a new command or expression. This way, I can squeeze more on a single line, so that you don't have to scroll too far up or down the page. Also, I'll often use 3, 4, 5 or more dots so that the text is nicely aligned. Finally, the number in the middle of the brackets represents the variable array number. As you can see, I've given an arbitrary value of -60 or +60 to each of the four points (or corners if you like). This means that each corner will be 120 pixels away from adjacent corners. By the way, the values in these 8 variables are never changed - even when we start moving and rotating. Instead, we store the rotation and movement in separate variables as offsets. So then, we want to be able to display this square on the screen, and move it on the X and Y axis (horizontally across the screen and vertically up and down the screen) live while the program runs. Anyway, where were we. The KEY= lines refer to when you press the cursor keys on your PC's keyboard. This should move all four coordinates of the square in the appropriate direction. SIZE is an arbitrary number to denote the size of the circle - nothing more. For now, I've given it an arbitrary value of 20 at the very beginning of the program. Also, as you can see, the "For" & "End_For" commands make sure all 4 variables of the square in the array are affected together. Finally, the "400" and "300" numbers are arbitrary values to (hopefully) centralize the square on your 800*600 pixel screen. They can be other numbers if you like. Now run the program to see if it works how it should. The divide symbol ("/") basically closes all numbers in on zero or makes them grow 'away' from zero. This will make the square grow larger or smaller on the screen! When the SCALE variable is very large, all numbers home in on zero, and could be said to approach a 'vanishing point'. With the addition of "/SCALE", the size of the circles will be appropriate - respective to the SCALE zoom level. That's it! Run the program and experiment with the different keys to see if it works. This code is inserted just before SPLAT (and just after: "For N=1 to 4"). Before you faint in terror though, let me give you a description of what this code actually /does/. Imagine you have a point at coordinates X(N),Y(N). Picture a circular path coming from this point (yellow point in diagram), and circling around a separate pivot (blue point), eventually reaching back to the point (yellow point). Depending on the angle, what this code calculates is the X and Y offset required for this 'jump' to another position on this 'circle'. 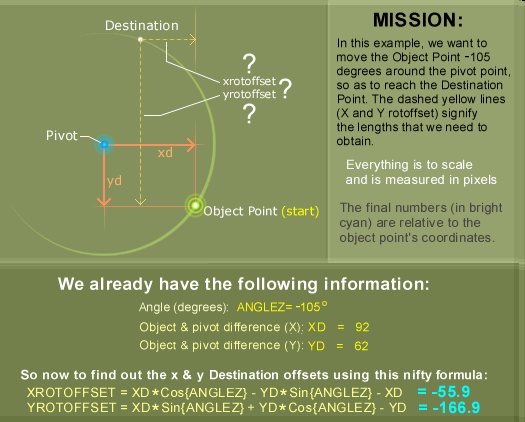 So, you input five variables (x+y original point, x+y pivot location, and angle.........., and the math outputs the desired two variables: the new x and y position (or rather, offsets) of the object point). Except you will not have to imagine any longer. A picture is worth a thousand words, so for a clear example of this, look at the diagram. You can skip trying to figure it out, but it's always nice to know what's going on. The code works globally for any point (good news for our square), and all it needs is for us to define the position of the pivot (If you leave out the pivot variables altogether, or define PIVX & PIVY as zero, then the square would rotate around the origin (x=0, y=0), or 'on the spot' in our square's case as it's centered on the origin), and for the angle of rotation (ANGLEZ - default again is zero), and then the code calculates the X & Y offset (XROTOFFSET & YROTOFFSET) automatically. By the way, XD and YD are just temporary variables - used mainly to simplify the look of the code. By the way, the square brackets I've used represent standard mathematical brackets to separate the math properly. Simply replace old SPLAT with this newest SPLAT. And the next ones changes the location of the pivot. It looks cool when you see the square rotating around a pivot that's somewhere else. As you might guess, by default, the pivot is situated at 0,0 - i.e. in the middle of the square, so normally, the square rotates 'on the spot'. As you can see, we're just stating the x, y & z position of each cube corner. If you like, you could use a variable to replace "8", and define this variable at the beginning of the program according to how many points you have, but leave it as it is for now. From these 4 lines, look at the 3 & 4th long ones. To refresh you memory, this rotates on the Z axis. Now we're in 3D though, can you guess what we add? Yep, two more 'pairs', so that we can rotate on the other 2 axis (X & Y). Replace the above 4 lines of old code (shown above) with this new code below. Look to see what's different. Note: XD, YD, ZD, and ZX, ZY, YX, YZ, XY, XZ are simply temporary variables. It's possible to use none of these variables, but it would've been at the expense of clarity (which is paramount at the moment - especially considering the apparent complexity of the routine). What's important to know is this whole routine will output just 3 important variables at the end (the X, Y & Z 'ROTOFFSETs'). Right, initially, it looks ten times worse than before doesn't it? But really, it isn't all that bad. As you can see, there are 3 'pairs' now (look at the ZX= & ZY=, YX= & YZ=, XY= & XZ= to represent the 3 axis). But why does the code for the YX= & YZ= pair of lines seem to be longer than the old ZX= & ZY= pair? And why are the XY= & XZ= pair of lines longer still? It's a good question, because one would expect each pair to be the same length. In fact, it's got nothing to do with the fact that the X axis (XY & XZ - third pair) is more 'special' than the Y or Z axis. The real reason is because each pair has to take a variable from the calculation of the pair that preceded it. In fact, the above code is just one of six possible configurations. I could have chosen five others, and the code would effectively execute the same thing. After closer examination, you'll see what's been 'added'. In the first part "[XD+ZX]", the "ZX" has been added to the sum. It's also been tagged on to the end of the first line too. It turns out that ZX is one of the variables from the /first pair/. It is added to the amount in this second pair because the math has to take into account the previous calculation. It can't just work out the sines and cosines of certain angles - it also needs them to work on the sines and cosines of calculations that have already been made, so that a 'master' offset rotation can be figured out. The same reasoning applies to the third pair too - in this instance, variables taken from the preceding first /and/ second pairs are used in the math. These 3 statements simply add up all the 'rotational offsets', so that they can be used in the final SPLAT conversion routine. The above should hopefully be self-explanatory. But just quickly, keys 3 and 4 alter the Y angle, and keys 5 an 6 alter the X angle. That's it for isom! A second congratulations is in order. You should now be able to 'rotate' the cube in all 3 dimensions! The code 'Wait 2' means that the program won't switch between Isometric and 3D a million times a second. You might want to use something more efficient (such as the program knowing when the key has been let go). "Else" means to execute the code below it, if MODE wasn't equal to zero. The rest should be self explanatory. But hold your horses though - we haven't even defined what the CAMZ variable is yet, let alone why we need those SCALE=SCALE*/CAMZ lines. Suffice to say that the program will work without them, but unless we have them, the scale will go awry (massively too big or small) when we swap between the Isometric/true 3D modes while the program is running. 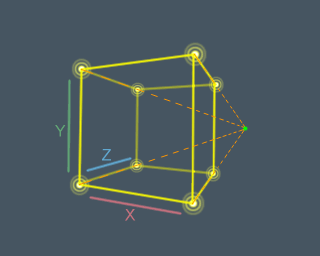 Because we're in true 3D, if CAMZ equalled 0, we'd be /INSIDE/ of the cube, and barely be able to see a thing - if at all. At 300 though, we can see the action at a distance. CAMX and CAMY can remain at zero of course. Now we pay a final visit to SPLAT (you knew that would come again sooner or later, didn't you). Aha! Take a look a the last 3 lines (Z, X & Y). Now we've just had a glimpse of the new /Z/ variable. It's needed to take into account the 3rd dimension, and also effectively provides us with a 3D vanishing point (more on that in a bit). Also, notice how the CAMera X and Y variables are /inside/ the brackets, while the normal movement variables (MOVEX and MOVEY) are /outside/ as usual. This is done because we're not just 'scrolling' a flat 'piece of paper', but instead moving the camera 'properly'. This way, we'll notice that the cube moves in /parallax/ (where the front of the cube seems to be moving more quickly horizontally/vertically across the screen, than the back). Naturally, we'll still be able to 'scroll' the scene in the old 'flat piece of paper' way (MOVEX & MOVEY) via the cursor keys, so we'll add different keys to move the camera around in a moment. Another thing that was added to the old SPLAT that's clear to see. As well as dividing by SCALE, we're now also dividing by the Z variable. This is because we're now taking into account another factor which determines how close an object point is to the 'vanishing point'. Before, only the SCALE had to be enlarged for all object points to move towards one tiny area of the screen (i.e. towards the vanishing point). But now there's another way. Now, an object point can be further back in the Z direction, and therefore, it will /also/ be closer to the vanishing point. This is more commonly known as 'perspective'. Because of this, we use the first Z line to determine exactly how far into the distance that an object point is, and then divide by Z in the last two lines. Clever huh? If you're still confused, see the following diagram for a clearer explanation on how the new Z perspective works. Sideline: What's so different between the CAMZ and SCALE variables? How will changing these differ in terms of how it looks? Well, one is moving the camera, and the other is 'moving' the scene. Here's another way of looking at it. There's two ways of 'zooming into' something. You can either /move forwards/ - which is what CAMZ does, or you can 'zoom in' by SCALING the scene (remember the flat piece of paper analogy). As you can see, there's a /big/ difference. Yet another way of looking at it is; If you just SCALE into the picture, you'll never be in front of it, now matter how big it gets. However, if you instead /move forward/ into the scene, then you'll get closer and closer (so it gets 'bigger' in that way), but at some point, you'll be out /in front/ of the object, and not be able to see it anymore. One last side effect: With CAMZ, you'll be able to see /parallax/. With ordinary scaling, it's just making everything look proportionally 'bigger' or 'smaller'. So what next? To account for this new way of Camera 'moving', we'll need four more keys. I know - instead of using the cursor keys, we'll use the arrow keys of the keypad (which are 2, 4, 6, 8 ). You'll be familiar with how Z determines how far into the background an object point is, because it's the same line of code that we just used for the SPLAT routine. You're never going to believe this. We're all done!!! Now, before you excitedly try it out, let's take a final look at the whole program. Lines that use ">>>" at the beginning are quote lines so that I can mention what part of the code it is. I'll 'close' with arrows going left (i.e. "<<<") to signify the end of that code part. CAMX=0 ..... CAMY=0 ..... CAMZ=300       // Position of the camera. MOVEX=0 .... MOVEY=0 .... SCALE=1        // Image fixed to 'paper' so you can move around and 'scale' in/out. PIVX=0 ..... PIVY=0 ..... PIVZ=0         // Pivots x, y and z. This should make the cube rotate automatically! Now we have an all singing, all dancing cube. Is there anything left to do? As an exercise for the reader, try to build up a 1,000 point 'cube' (10*10*10) points by adding a relatively small amount of code to the beginning. The effects of 3D look spectacular when there are so many points to rotate and move through! /Especially/ if your PC is fast enough to display everything in 50 FPS (frames per second) realtime. And now for something completely different... You've learnt how to program a cube, now learn how to draw one with this excellent tutorial at Castlezzt.net (original link was down from here, so this is a mirrored version, but the original creation was castlezzt.com). 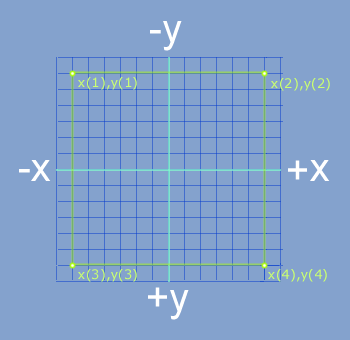 Scaling, rotating and translating coords in 2 and 3 dimensions using matrices - - - An overview of how you would use matrices to represent rotation, translation, and scaling functions. Stereoscopic 3D gallery - - - Computer generated 3-dimensional graphics. Many require '3D glasses', but you can see some of them by crossing your eyes.